Image via The Disney History Institute. Click for many more fantastic images of the Moonliner and promotional items for the attraction itself. This attraction, sponsored by TWA and Howard Hughes, opened at Disneyland on July 22, 1955 and represented what space travel was to be in 1986. Designed by imagineer John Hench, and NASA’s Wernher von Braun, it bears a strong resemblance to the V2 rocket which is no surprise given that von Braun designed the V2. Given von Braun’s role in missile development for the Germans in WW2, and how the V2 was utilized, the utilization of this particular design is somewhat chilling. However, the educational nature of the attraction itself represents something transformational about not only the design, but perhaps about von Braun himself. The Moonliner was in place in Tomorrowland until the 1967 refurb when the show was renamed “Flight To The Moon” and the Moonliner structure was removed. The attraction itself inspired a board game which was published in 1956. 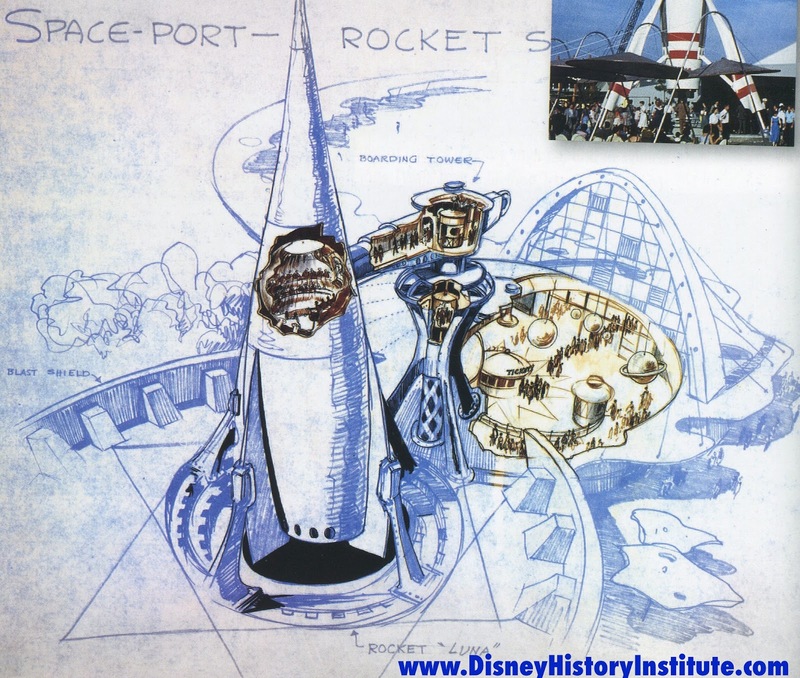 This entry was posted in Disneyland, Gothic Disney, Tomorrowland and tagged Disneyland, Howard Hughes, John Hench, Moon, NASA, Wernher von Braun. Bookmark the permalink. Fascinating. What happened to the structure after 1967?